In September I discussed reasons why I expected the Euro to turn up in November or December of this year. That time is upon us, and I am watching the Euro carefully to see whether it is going to manage a turn up. I presented various ideas about the magnitude of this trough in September, but rather than going back over that and getting distracted by longer term considerations, I find it easier to focus on the fact that the trough I am expecting should be of at least 40-week magnitude. That provides us with a bearish outlook for the next six months or so. The bearish shape of the 40-day cycle into the November trough is clear (early peak, lower closing trough), but something interesting has happened since then: the 20-day cycle from 7 November until 24 November is not bearish … and so is it possible that we are seeing a turn up? That doesn’t look much like a bounce out of a 40-week cycle trough, but not all troughs form perfect V-shapes. Often we see the first cycle or two of the shorter cycles seem to struggle to develop much bullish power before the market does eventually leap upwards, and the trough becomes apparent. Whether that happens here remains to be seen, but it is not impossible that the 40-week cycle trough did form on 7 November 2014. I will be watching the Euro very carefully over the next week or so because it is at a critical juncture. Let me know what you think is happening. 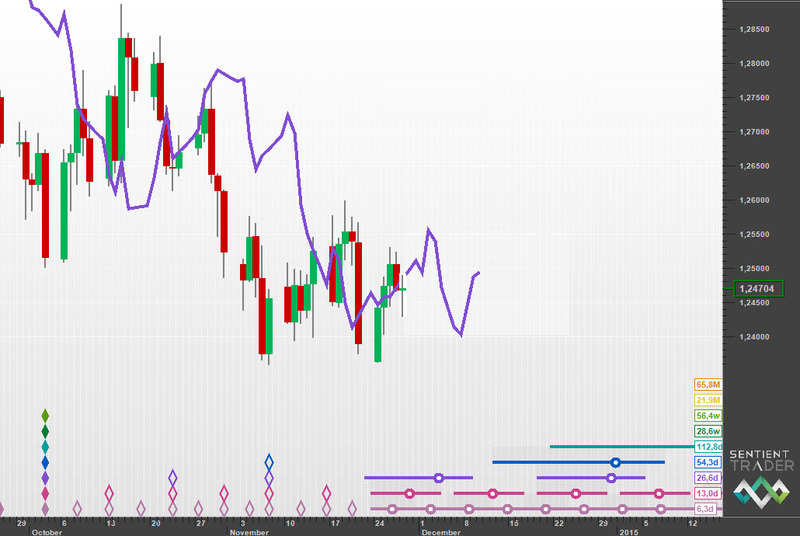 I agree that we are nearing an important turn in the Euro. Because the USD/CHF pair has been in existence far longer than the Euro, and because it has a strong tendency to move exactly opposite to EUR/USD, I’ve been using Sentient Trader / Hurst analysis of the USD/CHF pair to assist in predicting movements in Euro. A Sentient Trader analysis of USD/CHF starting in 1993 catches the obviously significant trough of 1995, and times the major troughs from there. That analysis indicates that both the 9-year and 18-month cycles crested and rolled over back in August of this year, and also indicates that the 80-day, 20-week, and 40-week cycles are are due to crest in December 2014, January 2015 at the latest. The 80-day and 20-week crests are aligned fairly closely, pointing to a significant top in USD/CHF (and therefore a bottom in EUR/USD) coming in mid-December. The Sentient Trader USD/CHF analysis goes on to project a strong nest of cycle troughs (up to 4.5-year) due in July-September 2015. Based on a combination of the Sentient Trader USD/CHF analysis, and my interpretation of the internal wave structure, attached is my 240-minute Elliott Wave Count for USD/CHF, including associated Fibonacci price targets. Shown on the chart is the most recent Sentient Trader 15.7-week cycle trough and crest zones from the Sentient Trader analysis. If this roadmap proves correct, we should see a big trend change in the Euro in mid-December (January at the latest), but not before the completion of one last 380 pip, wave-5 thrust from a small-degree wave 4 triangle. So here’s my Elliott Wave count on EUR/USD, utilizing the same mid-December target zone for an 18-month cycle from the USD/CHF analsysis (shown in my last comment to this post). Because of the strong inverse correlation of these two pairs, there is an expectation a trough in EUR/USD instead of the crest associated with USDCHF. I think its important to note that currencies don’t necessarily exhibit rounded tops and V bottoms like stock indices do. This is why I’m fairly comfortable using the projected Sentient Trader crests as equal in importance to troughs in forex. 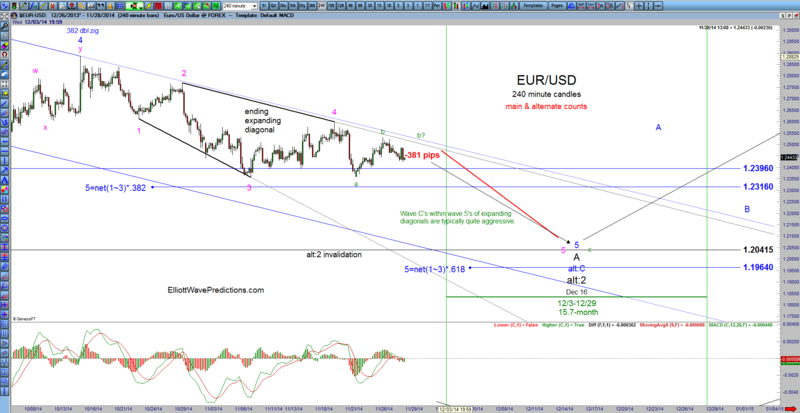 While the USD/CHF should race to the upside in a thrust from a wave 4 triangle, EUR/USD needs to finish a wave 5 to the downside, completing an ending expanding diagonal Wave C’s within wave 5’s of expanding diagonals are often just are aggressive as wave 5 thrusts from wave 4 triangles. The net result of the two pairs should be about the same, buy exact exactly opposite. A strong 380-pip move to end the trend. Thank you Sid. 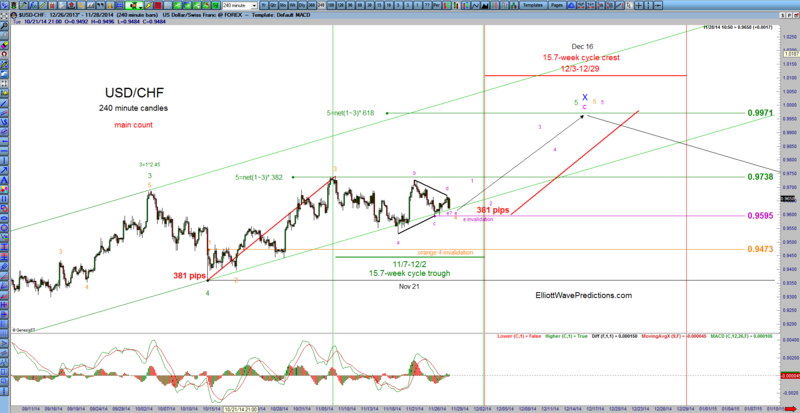 It is very interesting indeed to see a comparison with an Elliott Wave analysis. 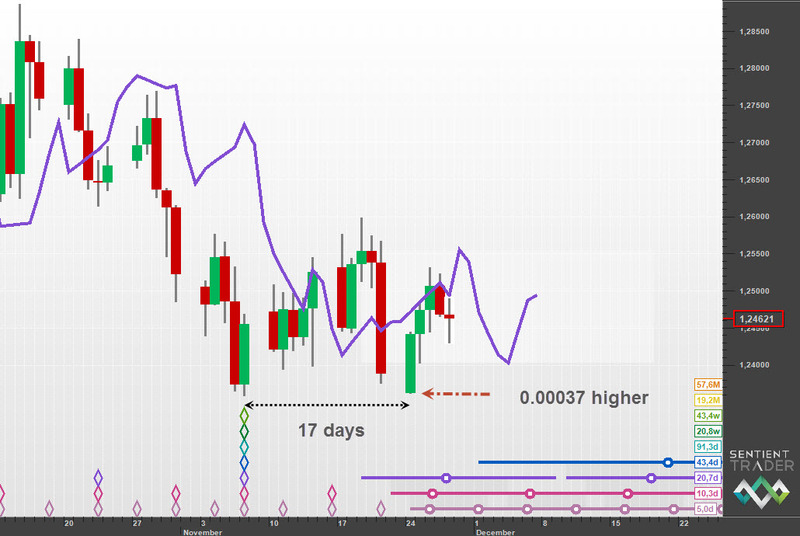 I am also going to take a look at an inverted analysis on the USDCHF (with synchronized peaks).